Free from Lorraine Stangness of Country Creations, this project is made only with half-square triangles and squares. Simple to do but the result is a beautiful design. 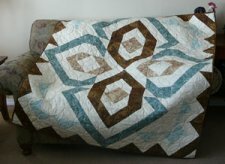 By changing the sizes of the half-square triangles you can make many sizes of finished quilt from the pattern. Finished Size Varies: 28" x 32" - 70" x 80"